My step daughter came over for dinner last night. When she wants a home cooked meal (which seems to be most time these days), I always try to do something special for her. Plus since she is vegetarian borderline vegan, I have to often pull out my old modified favorites from my macrobiotic vegan/vegetarian days. That said, I do still opt to cook mostly vegetarian but they are my fast go to recipes. I want it to be a little more special when she comes over. That doesn’t mean difficult. In fact, this is probably one of the easiest to make desserts that I have ever made. The idea comes from the basics of a Dutch apple pie. I have been making this for years and with only 6 ingredients, its super easy. I also saw this super cute pin on Pinterest of a lattice apple pie inside the shell of an apple, and well, what can I say. Inspiration hit. So I evented my Dutch Apple Pie Apple! It was a super hit, though in hind sight it would be even more delicious with a scoop of vanilla bean ice cream on the side. Calorie wise its about the same as a typical slice of pie so not an every day dessert. But definitely a yummy if I may say so myself! 1. Grab a 9 x 13 baking pan/casserole dish, melon baller (or strong spoon but highly recommend melon baller), knife, fork, measuring cups and spoons, and two regular sized mixing bowls. 2. Make sure your apples stand up straight on their own. Slice off the tops of the apples. Save in case you need them for filling. 3. Using a melon baller, hollow out the center of the apple, making sure to not get too close to the skin so the apple shell stays intact. Cut off and discard the core pieces. Chop and place remaining apple pieces into one of the mixing bowls. If you are a skilled apple hollower, then your 5 apples should be plenty for the filling. If not, you may need one or two extra apples to use as additive filler. As I said, you can use a spoon. My melon baller seemed to have sprouted legs and hid from me when it heard of my plan. So I was left with my spoon. After a few choice words when I couldn’t cut through the core with my spoon and feeling like I needed to be a body builder to accomplish the task, I ended up with what I will call shards of apple to use as filling. First item on this week’s shopping list – MELON BALLER. 5. Add 3/4 cup of brown sugar and the cinnamon to the apple pieces. Mix together. Keep stirring until a nice syrup starts to form. Fill each apple so it is level on the top. 6. Create the crumble topping by combining the flour, remaining brown sugar and butter in the other bowl. Using a fork, combine the three ingredients by cutting the butter in. Keep doing this until you get a crumbly mixture. If your ingredients start to form a ball, your butter is to soft. Place it into the fridge for about 5 to 10 minutes and begin to cut the butter in again until it is crumbly. 7. Add the crumble to the top of each apple, slightly pressing in so it will stay on top. Place the apples upright into the baking pan and in the oven. Cook until the apple is soft. This is about 30 to 40 minutes. Check every 15 minutes. 8. Cool slightly. Serve warm with a scoop of vanilla bean ice cream as an optional side. 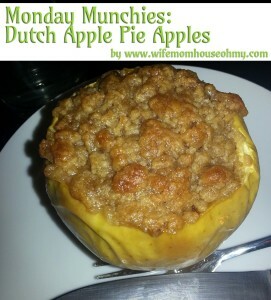 There you have it, my Dutch Apple Pie Apple! Now this is definitely an apple a day to keep the doctor away that I can do!